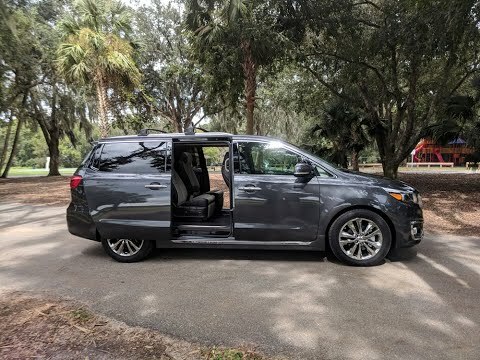 A favorite with families looking for a comfortable, versatile and safe minivan, the popular 2018 Kia Sedona is available with seating for seven or as many as eight passengers. With a starting price under $28,000, the new Kia Sedona is also less expensive than the Honda Odyssey and Toyota Sienna and it has a much longer warranty than the Chrysler Pacifica. Spacious 8 passenger vehicle that fits my family perfectly. A lot of space for groceries in the back. Fuel efficient, the automatic doors are incredibly easy for my older passengers. The self adjusting seats is another feature that is great, my husband is 6'2" and I am 5'2", only push the button and voila I am comfortably in my spot. No problems! Love the car, offers three row seating. Maybe the truck could be bigger but that's hard to do with three rows. A built in net for the groceries would be nice instead of having to buy it. Its comfortable. Ok I seriously can't think if anything else to write, to make 250 characters. Lets see if this is enough. It is bluetooth accessible. This helps with directions and music. I like the majority of features, particularly the amount of room available when seats are put down. My main complaint is that there is no seat position save systems, so that when different drivers sit down they can hit a button and their seat arrangement is recorded. There is also no CD player, which is disappointing. 2015 KIA Sedona Snowy On-Road Review: Buy it!